End MPD participation in US-Israeli police exchanges of worst practices. For over a decade, MPD leaders, including Chief Peter Newsham, have participated in trainings with Israeli military and police, institutions which enforce an illegal military occupation over Palestinians. As Amnesty International has documented, Israeli forces are responsible for: (1) the police killings of Palestinian civilians - including children; (2) arbitrary arrests and detentions of Palestinians for sometimes indefinite periods of time; and (3) the targeting of human rights defenders who engage in freedom of expression, association, and assembly. The Anti-Defamation League’s “National Counter Terrorism Seminar” takes US police leadership to Israel to learn from the officials who promote these practices, including: (1) the Israel Security Agency (aka Shin Bet), which is notorious for targeted political assassinations; (2) the Israeli National Police and Israeli airport security, whose practices officially embrace racial profiling; and (3) the “riot-control” unit of the police, whose ranks draw heavily from the military and which is deployed to attack and disperse nonviolent Palestinian protesters. Trainings that encourage these worst practices threatens many of our residents, particularly communities of color in DC. Police killings: In Palestine, Israeli police kill Palestinians with virtual impunity to enforce a military occupation. In DC, we oppose trainings that posit military occupation and police violence as a model. We echo the calls for justice for Terrence Sterling, Alonzo Smith, Javon Hall, Ralphael Briscoe, and so many other Black people killed by police. Racial profiling: Discriminatory policies—like “jump-outs” in DC and “stop-and-frisk” in Jerusalem—that criminalize Black and Palestinian communities don’t keep anyone safe. In DC, we believe safety for all can be best created through the evidence-based, public health-based solutions of the NEAR Act, including hiring community members trained to interrupt community violence. Repression of protests: Political demonstrations in DC should not face a shower of chemical weapons and rubber bullets, like Israel uses against Palestinians. MPD must not purchase or deploy crowd control weapons that are used to violate first amendment rights and injure innocent protesters and children. It’s time to end these trainings, which represent a deadly exchange of worst policing practices. Israeli occupation is no model for DC. To Police Chief Newsham: Immediately cease DC police participation in training exercises with Israeli law enforcement and military, so that worst practices like police killings, racial profiling, and repression of protests are not endorsed as a positive model for DC. 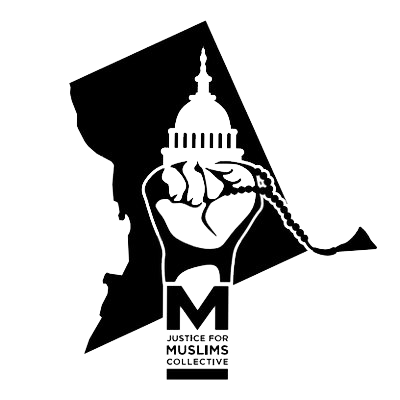 To members of the DC Council: Support and pass legislation to prevent MPD from training with discriminatory trainers that violate DC's Human Rights Act. MPD has failed to implement an extant regulation to this effect (6B DCMR Sec. 1308.3), so civilian leadership needs to act. We call for a reformed Office of Police Complaints with elected leadership, a purely civilian board, and power to oversee MPD's trainings, so that MPD will no longer train with occupying armies.